This is not a review. I repeat: this is not a review. It’s more of an invite to go and have a look (taste) yourself. There are several reasons why this is not an actual review. When I visited Bun Tea House, a few months ago, they had just opened. The bar downstairs was still closed and they did not have an alcohol licence yet (but the beer list looked very interesting). Most of their pickles were not ready, either. Also, I’m not sure I could be objective because I was just so… happy. Excited. It’s that special, bizarre feeling that only the first day of spring can give you. The first day where the sun is warm on your skin and you can take your coat off. The first day of leaving the office in daylight – I repeat, actual non-artificial non-LED light coming from that elusive ball of fire we all sort of forgot about last winter. On this special day I happened to stumble upon Bun House, its tiled blue chairs like the bottom of a pool, huge bamboo steamers and the calming smell of wood and steam, jars of colourful pickles, the tables spilling onto the pavement. Sitting outside and observing this pulsing corner of Soho with the palest, fluffiest buns gave me some sort of natural high that I believe has rendered me completely non-objective. As well as buns, Bun House serves a rather interesting set of dishes of which I tried none but that will keep me intrigued enough to keep coming back. Suffice to say that the house fries are fried duck tongues. The menu is utterly confident in its use of offal and traditional Chinese ingredients in the most innocent looking parcel: a steamed bun. The lamb was juicy and spiked with cumin, while the chicken, with liver pate gifting depth of flavour, was genuinely addictive. 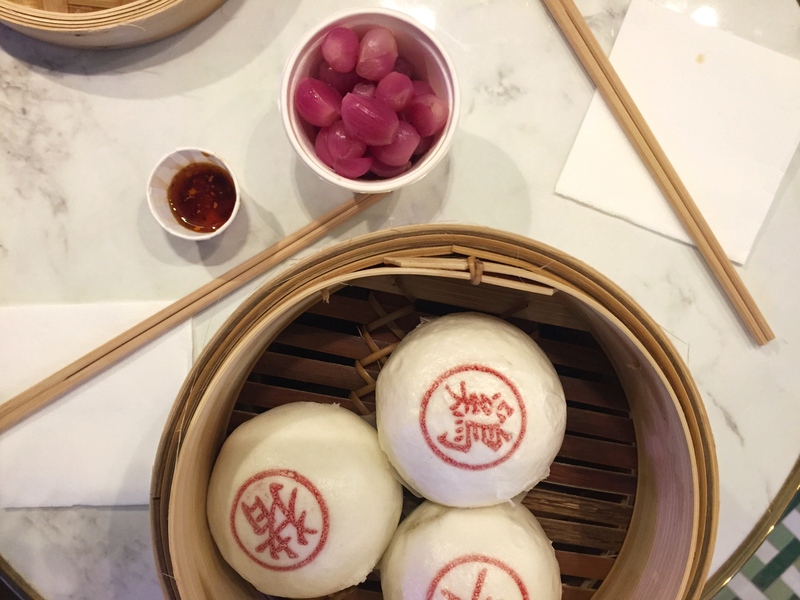 They also have some sweet buns – a chocolate one with pig blood (yup) and a seemingly safer custard one with salted duck egg, coconut milk and carrot; an oozing, wonderful custard with a little tropical sweetness and savoury notes for balance. They also have the most beautiful, soothing website – and a cute little “squirty” icon for the oozy sweet buns. I cannot wait to go back and try every item on the menu – I think you should, too.